Kanada, Y., International SFF Symposium 2013 , 2013-8. Abstract: Usually, objects are horizontally sliced when printed by 3D printers. Therefore, if an object to be printed, such as a collection of fibers, originally have natural direction in shape, the printed direction contradicts with the natural direction. By using proper tools, such as field-oriented 3D paint software, field-oriented solid modelers, field-based slicing algorithms, and non-horizontal FDM 3D printers, the natural direction can be modeled and objects can be printed in a direction that is consistent with the natural direction. This consistence results in embodiment of momentum or force in expressions of the printed object. To achieve this goal, several manufacturing problems, but not all, have been solved. An application of this method is (Japanese) 3D calligraphy. Dasyn.com, Maker Faire Tokyo 2013, 2013/11/3-4. Kanada, Y., 19th International Symposium on Artificial Life and Robotics (AROB 2014) , 2014-1. 要旨: 3D printing technology usually aims reproducing objects deterministically designed by 3D CAD tools. However, 3D printing can generate patterns similar to randomized (non-deterministic) 1D or 2D cellular automata (CA). Cheap fused deposition modeling (FDM) 3D printers can be used for this purpose. By using an FDM 3D printer, melted plastic filament is extruded by a hot nozzle to shape a 3D object. They can generate CA-like patterns with constant head motion and constant filament extrusion and with unintended fluctuation but no explicit randomness. Because of fluctuation, every time the printer generates a different emergent pattern. This paper proposes a method for printing seaweed-like patterns of 1D and 2D CA using FDM, and computational CA models. This method will open a new horizon of 3D printing applications. Kanada, Y., 8th International Workshop on Natural Computing (IWNC8) , 2014-3. Abstract: Fused deposition modeling (FDM) is a 3D-printing method that shapes 3D objects by layering melted plastic filament. The process of this type of 3D printing can be regarded as asynchronous cellular-automata because it generates 1D on-off pattern per a head motion. Especially, by a constant head-motion at reduced constant extrusion-velocity, a 3D printer can generate self-organized grids or similar structures, which is much finer than artificial (i.e., program-controlled) patterns. Depending on the parameter values, i.e., layer depth, extrusion velocity, and so on, the generated pattern varies among regular stripes, stripes with crossing waves, and splitting and merging patterns. Some of the patterns can be simulated by a computational model, i.e., asynchronous cellular automata. Kanada, Y., BIT’s 1st Annual International Congress of 3D Printing , Dalian, China, June 27-29, 2014. 要旨 – Conventional 3D design methods design only the surface of 3D objects and conventional 3D printing methods only slice and print 3D objects horizontally. We in Dasyn.com develop new 3D design methods that enable designing real 3D objects including the internal structures and textures, and develop new 3D printing methods that enable printing patterns with non horizontal directions. The “real 3D design method” makes transparent objects and objects with holes much more realistic, and the non-horizontal 3D printing method enables naturally-directed objects such as 3D calligraphies. We also develops a naturally randomized or fluctuated 3D printing method. We seek partners who will develop applications of these methods. Kanada, Y., 2014 International Symposium on Flexible Automation (ISFA 2014) , 2014-7. 要旨: Although 3D objects to be printed may have “natural direction” or intended direction for printing, most 3D printing methods slice and print them horizontally. This causes staircase effect on the surface and prevents expression of the natural or intended direction; that is, the natural direction and the printing direction contradict. This paper proposes a methodology for direction-specified 3D printing and methods for designing, partitioning, and printing 3D objects with specified printing direction using a fused deposition modeling (FDM) printer. By using these methods, printed objects do not only have unnatural steps but also enables to express the direction explicitly. By developing and evaluating a set of methods based on this methodology, chained rings of an Olympic symbol are designed, partitioned, and printed by a delta-type 3D printer, which is cheaper but can move quick vertically. The rings were well designed and printed rings look well. Although there are still several unsolved problems including difficulty in deciding part partition points and weakness in the partition points, this methodology will probably enable new applications of 3D printing, such as 3D calligraphy. 金田 泰, 情報処理学会 夏のプログラミング・シンポジウム 2014 , 2014-8. (ICAM-BM 2014, Beijing) , 2014-11. Abstract: Direction-specified 3D modeling and FDM-based printing methods enable expression of natural directions, such as hairs, fabric, or other directed textures, in modeled objects. This paper describes a method for creating various shapes of generative artistic objects with several specialized attributes by applying three new techniques to the direction-specified methods for better artistic expressions. The most important technique is “deformation”, which enables deforming simple 3D models to create varieties of shapes much more easily in generative design processes. The second technique is called the spiral/helical printing method, which enables consistent print-direction vector field, i.e., filament directions, of the surface consistent with those of the interior portion and enables seamless or less-seam printing results. The third technique controls light reflection while printing by using the spiral/helical printing method with transparent PLA. It enables the printed objects reflect light brilliantly. The proposed method with these three techniques was implemented as a Python library and evaluated by printing various shapes, and it is confirmed that this method works well and objects with attractive attributes can be created. 要旨: 3D printing technology usually aims at reproducing objects deterministically designed by 3D CAD tools; however, the author has discovered that 3D printing can also generate self-organizing patterns similar to stochastic (or randomized) 1D cellular automata (CA). A method for generating patterns similar to randomized 1D or 2D CA by using a fused deposition modeling 3D printer is thus proposed. With constant head motion and constant filament extrusion and without explicit randomness, this method generates very fine emergent patterns with natural fluctuation. By means of this method, each time a different pattern is generated. 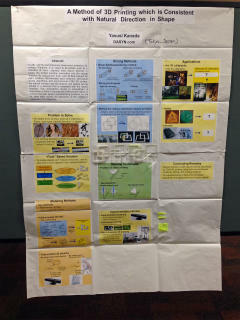 In addition, a computational CA model that simulates the above process is also proposed. The proposed method will open a new horizon of 3D printing applications. Kanada, Y., Int. Journal of Engineering Research and Applications (IJERA) , Vol. 5, No 4, Part-5, April 2015, pp.70-77. 要旨: When creating shapes by using a 3D printer, usually, a static (declarative) model designed by using a 3D CAD system is translated to a CAM program and it is sent to the printer. However, widely-used FDM-type 3D printers input a dynamical (procedural) program that describes control of motions of the print head and extrusion of the filament. If the program is expressed by using a programming language or a library in a straight manner, solids can be created by a method similar to turtle graphics. An open-source library that enables “turtle 3D printing” method was described by Python and tested. Although this method currently has a problem that it cannot print in the air; however, if this problem is solved by an appropriate method, shapes drawn by 3D turtle graphics freely can be embodied by this method. Kanada, Y., International Journal of Computer, Control, Quantum and Information Engineering, WASET , Vol. 9, No. 4, pp. 689-693, 2015. 要旨: Objects are usually horizontally sliced when printed by 3D printers. Therefore, if an object to be printed, such as a collection of fibers, originally has natural direction in shape, the printed direction contradicts with the natural direction. By using proper tools, such as field-oriented 3D paint software, field-oriented solid modelers, field-based tool-path generation software, and non-horizontal FDM 3D printers, the natural direction can be modeled and objects can be printed in a direction that is consistent with the natural direction. This consistence results in embodiment of momentum or force in expressions of the printed object. To achieve this goal, several design and manufacturing problems, but not all, have been solved. An application of this method is (Japanese) 3D calligraphy. Kanada, Y., International SFF Symposium 2015 , 2015-8. Abstract: Material is stacked vertically and layer-by-layer in conventional additive manufacturing (AM) methods. An object with overhang or skewed stacking structure, such as a plain dish or an empty sphere, is difficult to be created by these methods without support material. This paper proposes a layer-less fused-deposition-modeling (FDM) method that enables mostly horizontal stacking of filament without support material. Such filament-stacking is enabled by increasing the height of the print head gradually, i.e., without layer transitions that make horizontal stacking difficult. The proposed method also allows controlling printing directions and various printing-direction-dependent expressions, such as fiber-like textures or brilliance, which make AM products attractive as final products for consumers or as some kinds of industrial products. Objects to be printed can be modeled as directed solid models designed by a component-based method (i.e., a new CAD based method) or a generative method, which are completely different from conventional CAD based methods. 要旨: When printing a plate (or dish) by an FDM 3D printer, the process normally requires support material, which causes several problems. This paper proposes a method for forming thin plates without using wasteful support material. This method requires several extraordinary parameter values when slicing plates. The experiments show that the plates can, for the most part, be successfully formed using a conventional slicer and a 3D printer; however, seams between layers spoil them and the quality of printed objects strongly depends on the slicer. 金田 泰, 日本機械学会 2015 年度年次大会 , G120 設計工学・システム部門一般セッション, 2015-9. Kanada, Y., 8th International Conference on Leading Edge Manufacturing in 21st Century (LEM 21) , 2015-10. 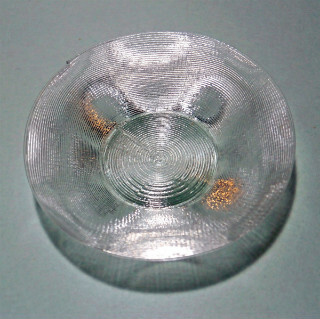 Abstract: Instead of printing layer by layer, thin 3D objects can be printed in better quality (without seams between layers) by printing helically or spirally by fused deposition modeling (FDM). When printing helically or spirally, the amount of extruded filament can be modulated using a bitmap; that is, “zero” in bitmap means “thin” and “one” means “thick” (or vice versa). This process generates a thin object, such as a sphere, pod, or dish, with a bitmapped picture or characters. A typical example is a globe, which is printed using a bitmapped world map. 金田 泰, 情報処理学会 プログラミング研究会 2015 年度 第 5 回 , 2016-2. 要約: 機械加工や 3D 印刷をコンピュータを使用しておこなうとき, 工作機械や 3D プリンタを手続き的 に制御するためのプログラムが必要になる. この目的のためにひろく使用されているのが G コードである. G コードはもともと切削加工の制御のために開発され,当初は設計者がそれによるプログラムを記述 していたが, 現在は設計者は CAD によって宣言的なモデルを記述し, それをコンピュータが G コードに 変換する. しかし, 3D 印刷のような付加加工のプロセスは切削加工より直観的なので, 設計者が抽象化された手続き的記述をすることが場合によっては利点があるとかんがえられる. そこでこの論文では手続き 的な 3D 設計用ライブラリを使用した抽象化された Python プログラムによって G コードのプログラムを 生成し 3D プリンタで印刷する方法とその使用例を示す. この方法では印刷可能な形状は限定されるが, 層をなくして層のつぎめもなくし, 従来の方法においてはオーバハングがあるときに必要だった支持材料 (サポート) もなくして, シームレスでより美的な印刷を実現した. Kanada, Y., Rapid Prototyping Journal , Vol. 22, No. 4, 2016. A methodology for designing and printing 3D objects with specified printing-direction using fused deposition modelling (FDM), which was proposed by a previous paper, enables the expression of natural directions, such as hairs, fabric, or other directed textures, in modelled objects. This paper aims to enhance this methodology for creating various shapes of generative visual objects with several specialized attributes. The proposed enhancement consists of two new methods and a new technique. The first is a method for “deformation.” It enables deforming simple 3D models to create varieties of shapes much more easily in generative design processes. 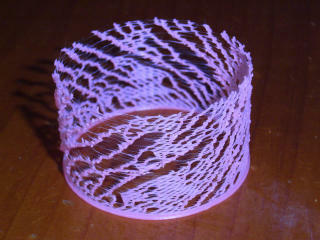 The second is the spiral/helical printing method. The print direction (filament direction) of each part of a printed object is made consistent by this method, and it also enables seamless printing results and enables low-angle overhang. The third, i.e., the light-reflection control technique, controls the properties of filament while printing with transparent PLA. It enables the printed objects to reflect light brilliantly. Kanada, Y., IPSJ Transactions on Programming , Vol. 9, No. 4, pp. 1–9, 2016-9. 梗概 (E): When manufacturing or 3D-printing a product using a computer, a program that procedurally controls manufacturing machines or 3D printers is required. G-code is widely used for this purpose. G-code was developed for controlling subtractive manufacturing (cutting work), and designers have historically written programs in G-code, but, in recently developed environments, the designer describes a declarative model by using computer-aided design (CAD), and the computer converts it to a G-code program. However, because the process of additive manufacturing, of which FDM-type 3D-printing is a prominent example, is more intuitive than subtractive manufacturing, it is some- times advantageous for the designer to describe an abstract procedural program for this purpose. This paper therefore proposes a method for generating G-code by describing a Python program using a library for procedural 3D design and for printing by a 3D printer, and it presents use cases. Although shapes printable by the method are restricted, this method can eliminate layers and layer seams as well as support, which is necessary for conventional methods when an overhang exists, and it enables seamless and aesthetic printing. Kanada, Y., Journal of Information Processing , Vol. 24, No. 6, pp. 908–916, 2016-11.